Roman Political Thought is the first comprehensive treatment of the political thought of the Romans. 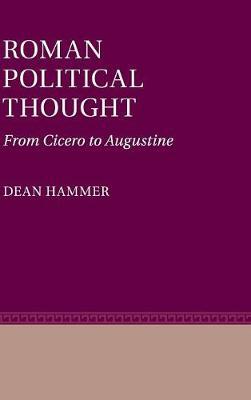 Dean Hammer argues that the Romans were engaged in a wide-ranging and penetrating reflection on politics. The Romans did not create utopias. Instead, their thinking was relentlessly shaped by their own experiences of violence, the enormity and frailty of power, and an overwhelming sense of loss of the traditions that oriented them to their responsibilities as social, political, and moral beings. However much the Romans are known for their often complex legal and institutional arrangements, the power of their political thought lies in their exploration of the extra-institutional, affective foundations of political life. The book includes chapters on Cicero, Lucretius, Sallust, Virgil, Livy, Seneca, Tacitus, Marcus Aurelius, and Augustine, and discussions of Polybius, the Stoics, Epicurus, and Epictetus.